I do love it when there’s a discrepancy as to who recorded a particular song first. That gets me digging even deeper into the roots to find the origin and it’s not always the person who wrote it. John D. Loudermilk and Tony Joe White were two prolific songwriters who both tended to record their own songs after other people had recorded them first. This week’s suggestion, The Green, Green Grass of Home wasn’t written by either of the aforementioned person, nor was it first recorded by its author. Marilyn Monroe made her screen debut in the 1950 film The Asphalt Jungle. It was a crime scene during that film that inspired Nashville songwriter Curly Putnam to write The Green, Green Grass of Home. It is the tale of a condemned prisoner who is dreaming of going back to the green grass home, but when he awakes, he remembers that he is about to face the electric chair. Like any archetypal country song, it makes references to the old hometown, a girl called Mary, a preacher, a death and a funeral. So who did record the original? Well, scan as many books and websites as you like and it’ll throw up the names Porter Wagoner, Conway Twitty, Johnny Darrell, Roy Drusky and Jerry Lee Lewis. Indeed they did all record a version, but most popularly it will say Porter Wagoner – the man who Dolly Parton famously wrote I Will Always Love You about after seven years of performing together. Wagoner also had his own TV show in America and Darrell and Putman were good friends and drinking partners in the mid-sixties. The answer lies in Wagoner’s biography where he states, “I first heard the song when Darrell sang it on my TV show.” Wagoner then brought Johnny’s record home to get his wife’s opinion of the song when he was considering cutting it. But Darrell wasn’t the first choice. Putnam actually wrote it for another country singer Bobby Bare who disliked it and turned it down. Melodically it was inspired by the gospel song The Old Rugged Cross which was written in 1912 by George Bennard and first performed the following year. Hundreds of acts have recorded The Old Rugged Cross but the only UK hit version of it, albeit a minor one, was for Ethna Campbell in 1976 where it peaked at number 33 but did spend 11 weeks on the chart. Tom had always claimed that his biggest regret was not getting into movies. Although he hated the film What’s New Pussycat, in 1965, he delivered the title song, which was very timely as it gave Tom’s chart career a much needed boost. In early 1966 he recorded another film title song and that was Thunderball for the James Bond movie of the same name. Although the film was a success and Tom often opened his shows with the song, it failed to make the Top 20 on both sides of the Atlantic. Tom’s version of the song also inspired Engelbert Humperdinck to check out the country back catalogue and Engelbert found a 1949 song called Release Me written and first recorded by Eddie Miller and his Oklahomas. Other big names who recorded the song were Dean Martin, Joe Tex, Johnny Cash, Nana Mouskouri, Joan Baez and Elvis Presley. During Christmas 1966, Elvis was driving from California back to his home in Memphis when Green, Green Grass of Home came on the radio. He couldn’t stop raving about it and got a friend of his in Arkansas to call the radio station and have them play it repeatedly. Elvis’ version charted in 1975 where it peaked at number 29. 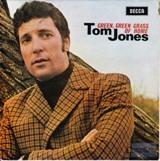 It became Tom Jones’ biggest UK hit selling 1.2m copies and was the first Decca single by a UK artist to sell more than a million copies in this country.